It’s my favorite day of the month — Book Review Day!!! March was a mixed bag of genres which I really enjoyed. Do you ever read too much fiction and find you are little burnt out after? Each new book this month was completely different from the last and it kept my attention throughout the month. This month I read my first informational book of the year and it made me want to add more informational/topical books into my TBR list this year. (If you don’t know what TBR means it’s “to be read.”). If you have any that you love and recommend, let me know in the comments below. Now let’s get into the reviews! Non-fiction is not everyone’s jam but I LOVE it. Everyone leads such an unique and interesting life and if they have gone through enough to write a book about it, I definitely want to read about it. Stephanie Land’s Maid, follows her life as a single-mother living in poverty and fighting the system and working as a low paid maid to pay her bills, feed her child, graduate from college, and dreaming about living in Missoula, Montana as a writer. Maid shows you the sad and frustrating truth about the welfare system in this country, how it is almost impossible to get in and out of and what it’s like to be treated as a “poor person” living off the government when it is your only option to live. I felt both completely sick to my stomach and moved to tears when I read about the man who annoyingly and condescendingly told her, “You’re welcome” as she paid with her EBT card at the grocery store. Maid is a fast read that will move any reader. Land doesn’t ask for your pity but for your support in changing the system so those who work hard to get out of poverty can do so without the shame that “poor” usually comes with. Is it a must read? Yes! I think empathy is something many people lack these days and Maid will open your eyes to that in a big way. Before reading this all I saw was everyone online saying it was “MESSED UP” or something along those lines with usually some expletives throw in. But after saying that they would all say it was one of the best thrillers they have ever read. I LOVE thrillers but honestly I was nervous to start this and OH. MY. GOSH. This book IS messed up and not for the faint of heart or anyone expecting or already a mother. Verity is named after one of the main characters who is a successful author who is medically incapable to finish her successful series of villain books. Lowen, an up and coming author is hired to ghost write the last remaining books and head to Verity’s Vermont family home to research the books and outline the next three. During her research she stumbles upon an autobiography Verity has written that follows Verity and her husbands relationship and life with three kids (2 of which has died in the same year). The autobiography is obsessive, incredibly disturbing, and very graphic in ways I never imagined someone would write about their own children. For the most part I was concerned for Colleen Hoover the author and how she could house this in her brain as a mother and wife!! So while you might be writing off Verity I will say that it is indeed one of the best thrillers I have ever read! Where the Crawdads Sing was one of the highest praised books last year and I’m so glad I finally read it! The quote on the cover describes this book perfectly, “Painfully beautiful…At once a murder mystery, a coming-of-age narrative, and a celebration of nature.” Set in the North Carolina marshes of the 1950s we watch the life of Kya Clark grow up from abandoned child desperate for love and companionship and how that leads her outside the swamps and brings her in deep, personal, and honest relationships but also to those who use her lack of social awareness against her. Crawdads is not the fastest read, but I promise you will love every word because of it sheer literary beauty. Owens makes it so easy to visualize the marsh and even Kya herself — you’ll feel like you’re watching a movie in your head. As you get near the end you'll be very satisfied, but its the last two pages that are the real treat and will leave you looking like this emoji 😱. Is it a must read? YES YES YES! 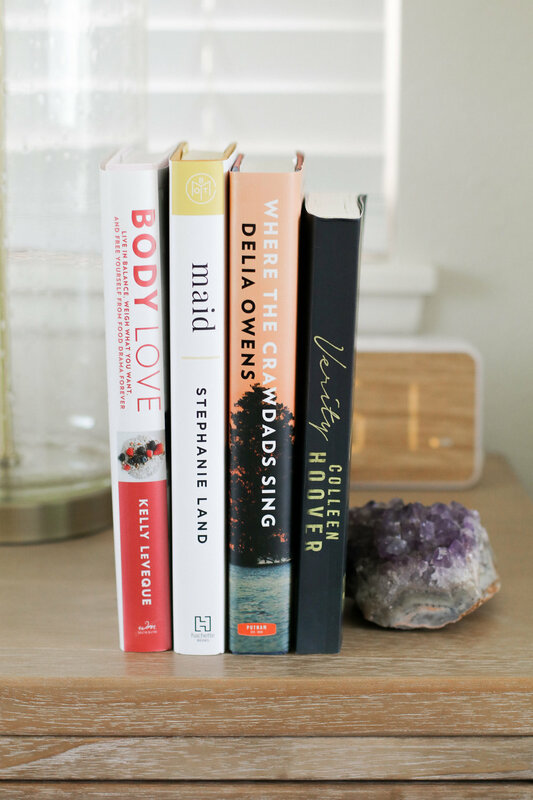 I’ve known about Kelly LeVeque for awhile due to celebrities and influencers who sing her praises with helping them find their own “body love” using her thoroughly researched “Fab Four” system. After being fairy strict with the ketogenic diet for 3+ months, Brett and I were looking for a high fat, low card diet but with a little more flexibility. Insert Kelly LeVeque. Kelly has been in the medical science field for over a decade and is now a nutritionist for people like Jessica Alba, Chelsea Handler, and Molly Sims. Her eating philosophy is centered around maintaining level blood sugar levels and how the traditional American diet is constantly yo-yoing it. I appreciate that her system is all about light structure, no counting, and no guilt. She recommends including the “Fab Four” into every meal: protein, fat, fiber, and greens. By consuming all of these items together in a meal of smoothie you will eat to satiety and allow your body to function the way it is intended to. I highly recommend to take a deeper dive in to the science behind her method and success! Is it a must read? If you are looking to educate yourself on nutrition and how food metabolizes in the body then YES! Since eating Keto and now reading this book I have become so much more aware of what I eat and it’s actually extremely liberating because I don’t have to question my food choices anymore! I think this is the first month where I claim every book as a must read! April’s books have some big shoes to fill. If you are brave enough to read Verity PLEASE DM me so we can discuss!!!! I still think about it almost daily — it was that good! What did you read in March and what’s in your TBR list for April? There’s an app for everything. I’m sharing my five favorite non-social media apps! Every book in March was a must read! The first half of the month was a slow read but this last week I was on fire — and now my eyes hurt. My picks for 5 best books in 2018! LAST Quarterly Book Review of 2018! The last book review post of the year! Happy reading! I’ve got six tips that will turn you into a reader! I guarantee it. I read so many books in July and August that the Quarterly Book Review has been moved up a whole month! Check out these great reads. Murder-mysteries, autobiographies, life through the eyes of a dog, I’ve got every genre covered.